Barely three months after they met in Singapore, President Donald Trump says he would be happy to sit down again with North Korean dictator Kim Jong-un. One might justifiably ask why, given how little the North has conceded since their last tete-a-tete. There is room to make tangible progress, however, if the US rethinks its negotiating strategy. Talks between the US and North Korea have foundered in part because of a fundamental contradiction in worldviews. It’s impossible for the US to imagine establishing a peaceful, normal relationship with the North until Kim has completely and verifiably dismantled his nuclear program. For North Korea, it’s impossible to imagine denuclearizing until its relationship with the US is peaceful and normal. So long as these issues are linked -- and so long as leaders in Washington and Pyongyang continue to cling to their particular understanding of how they’re linked -- even another Trump-Kim summit is likely to produce little. Doing nothing isn’t really an option, however. The US can’t simply console itself that its “maximum pressure” campaign continues to bottle up the North. Pressure to enforce sanctions, especially in China, has begun to wane. Meanwhile, South Korea seems to be racing ahead in its own peace talks, with the North hosting family reunions and Seoul boosting its inter-Korean economic cooperation budget to nearly $1 billion and seeking exemptions to international sanctions in order to engage Pyongyang. South Korean President Moon Jae-in plans to meet Kim this week, bringing along as many as 200 officials and businessmen on a three-day visit to the North. As time passes, this disconnect between allies will inevitably strain their relationship and put pressure on Washington to break the logjam. The way to do so -- and to avoid a potential public split with Seoul -- is for the US and South Korea to divide talks into two tracks, negotiating peace and denuclearization separately. For the US, this would mean supporting South Korea’s efforts to reduce the threat of conventional, as opposed to nuclear, war on the peninsula. At their first meeting, Moon and Kim agreed to pursue a host of initiatives designed to bring the two Koreas closer together, including “joint efforts to alleviate the acute military tension and practically eliminate the danger of war on the Korean Peninsula.” The two sides have since discussed a range of confidence-building measures designed to reduce the threat of conflict, such as restoring military hotlines and closing guard posts along the Demilitarized Zone that separates the two rivals. The commander of US troops stationed in South Korea approved the last move as a “reasonable risk.” The US can and should go further. The North’s conventional forces have been the cause of several previous crises, including the sinking of a South Korean warship in 2010. Anything that lowers the threat they pose -- especially an agreement to pull back the long-range artillery the North uses to threaten the Seoul metropolitan area -- would greatly increase stability and trust on the peninsula. The US has pursued similar initiatives in the past. As the Cold War wound down, for instance, Washington and Moscow successfully negotiated the Treaty on Conventional Armed Forces in Europe, which established limits on conventional military equipment in Europe and mandated the destruction of excess weaponry. Kim has also recently pushed for South Korea and the US to issue a declaration formally ending the Korean War as a precondition for discussing the specifics of denuclearization. Though any such announcement would not be legally binding -- and would have no formal impact on the US-South Korea alliance -- it would encourage those who want to see the US diminish and eventually withdraw its military forces from the Korean Peninsula. So the US should insist that the North first take tangible actions to demonstrate nonhostile intent to the millions in Seoul. If it does so, then the US could join such a declaration and allow peace negotiations to proceed. The Trump administration has resisted doing so until the North also provides a full declaration of its nuclear arsenal and agrees to measures to verify and then eliminate it within a certain time frame. This should be a separate discussion. 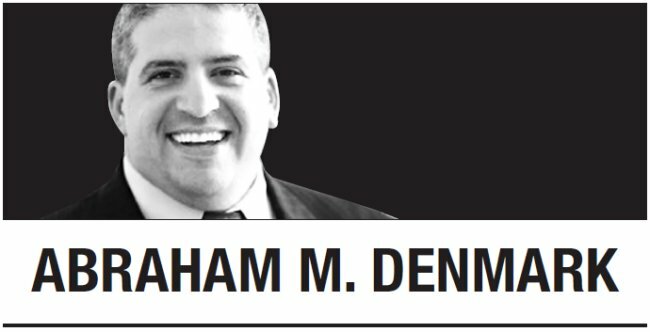 Whereas some may argue that the US would be surrendering significant leverage by delinking these two negotiations, the fact is that South Korea would be negotiating with North Korea to limit the size and scope of only its own military forces; US forces would not be included in those talks, at least in the opening stages. Moreover, the US would retain its most significant leverage -- its strategic military capabilities and international sanctions -- to press Kim on denuclearization. Continuing to resist what would be an essentially symbolic declaration risks making the US, not North Korea, look like the obstacle to peace on the peninsula. US negotiators should remember that reducing the potential for a devastating war on the Korean Peninsula is at least as important a goal as full denuclearization. If handled correctly, they should not have to sacrifice one for the other. 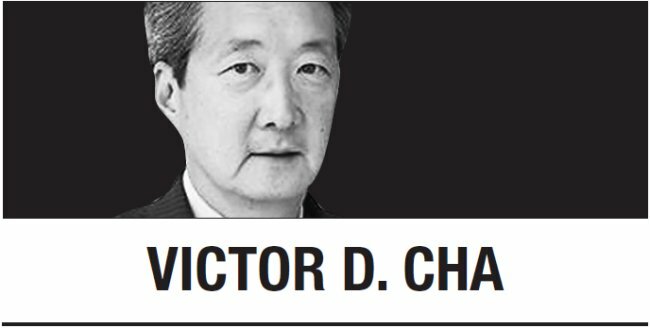 Victor D. Cha is Korea chair at the Center for Strategic and International Studies. Abraham M. Denmark directs the Asia Program at the Woodrow Wilson International Center for Scholars. -- Ed.